I've been using the same skincare for around six months now, which I genuinely have no issue with as they're fantastic products, but I was getting dare I say a little bored with my selection. I had a little look through the new releases I'd been kindly sent and decided to test out a bunch of new skin goodies. So, here's my first impressions and thoughts on these! First of all, we have the Vichy Idealia Peeling Radiance Activating Night Peeling Care - to give it its full name. This product looks like a toner, but the brand claim is has the power of a serum and can improve skin texture and radiance in four weeks. Containing 4% glycolic and 5% hepes, it's basically an overnight exfoliating toner which is suitable for those with sensitive skin. My complexion has always been a bit odd with acid toners, as previous ones I've tried have broken me out or caused little under the skin bumps, but this one seems to be working well. I'll report back in a month! Another one to use overnight is the Merumaya Retinol Resurfacing Treatment which I've used continuously for the last three weeks and I do really love it. I do like retinols and they seem to work well with my skin, so this beauty has been leaving my skin feeling so silky soft by the morning time! Next is a cleanser due by Pestle & Mortar, which are sold as a set. I've used a few of their products in the past, but I was quite excited to see a two step cleanser released by them. The first is Pestle & Mortar Erase which is a balm style cleanser with a slightly abrasive texture which removes makeup well and leaves skin feeling soft. My favourite of the two is the Renew cleanser which is a gel (its texture is similar to Oskia's Renaissance Cleanser) aimed to brighten skin and really cleanse it. It definitely makes my skin feel soothed and super comfortable. Finally, we have two treats from Elemis. 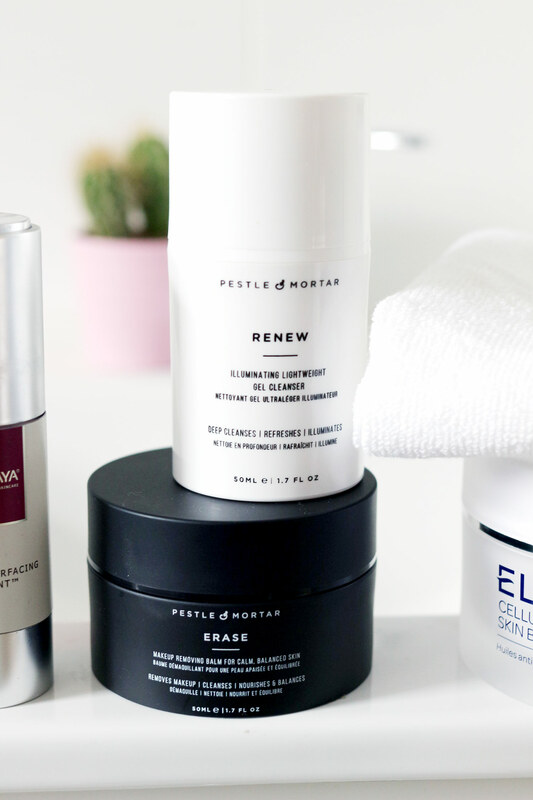 They're one of my favourite skincare brands, so I do enjoy using new products by them! The Elemis Cellular Recovery Skin Bliss Capsules have two parts - one for morning and one for evening. Both are oils, the day capsule is moringa and rose to brighten and evening is moringa and lavender to soothe skin. The treatment is aimed at tired/fatigued skin which is something I have right now so I'll be using these religiously over the next two weeks - I'll report back! The last product is the Elemis Pro-Collagen Hydra-Gel Eye Masks which I am obsessed with! You know when you're so tired and look like you haven't slept in a week? Pop one of these on and they brighten the whole eye area to make you look more errr alive. I love them! Are you trying anything new at the moment?